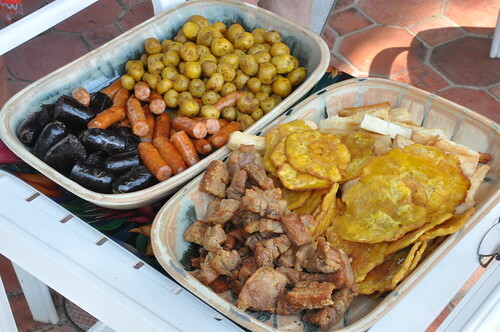 Blondie and Brownie: Travels with Brownie: Chicharrónes, Tostones y Morcilla! Oh My! Travels with Brownie: Chicharrónes, Tostones y Morcilla! Oh My! 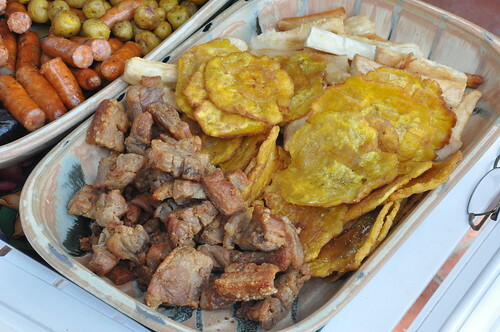 During our trip to Colombia, we had chicharrón multiple times, including one version in Cali that was more like deep fried thin strips of bacon, not that there's anything wrong with that, in fact my father-in-law is threatening to try it at home for an upcoming gathering. I suspect he will have the entire family's blessing. Personally I appreciate chicharrón in all forms especially if it comes with just a little spritz of lime or a touch of aji for a nice little touch of acidity. The photo above shows our whole snack time spread including roasted papas criollas--lovely, almost buttery, tiny yellow potatoes that grow in the Andes and are a key ingredient in ajiaco, traditional über-Colombian chicken and potato soup. I've been wanting to make some good ajiaco since I got back, but the papas criollas can be very difficult to find. I've occasionally seen them in in city preserved in jars, but I hear that the frozen variety is really much preferred if you can't find them fresh. Got any papas criollas tips for where to find them in the city? Hit me up in the comments. I'd love to get my fix soon! Street Vendor Project's 10th Anniversary!! Steeplechase Coffee Now Serving Dough Doughnuts! Get Your Food Films In! Travels with Brownie: Cupcakes in Colombia!